For those people who know me well, it will come as no surprise that learning and improving my skills means a lot to me. Ever since being at university, I’ve documented new designs and shown the process behind them, as I find the design process to resemble an iceberg, with the finished design the visible one-third and all the work that goes into it the hidden two-thirds! 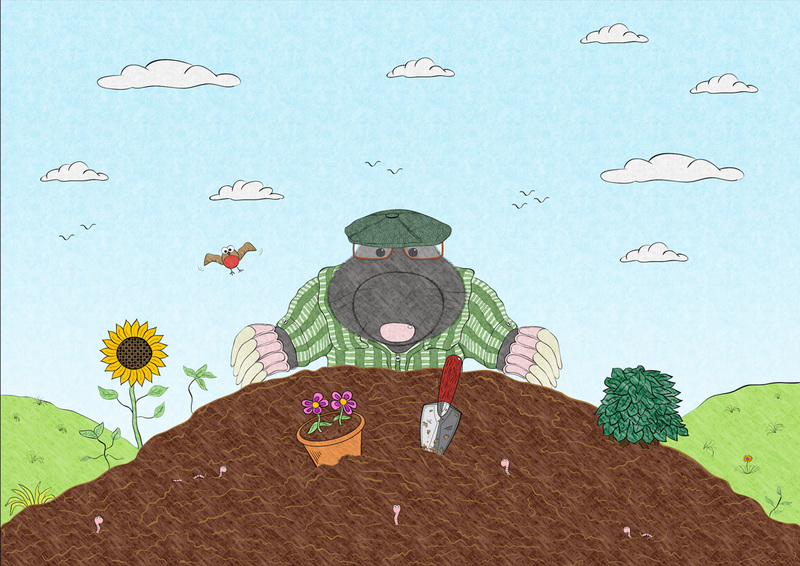 My latest work is a set of three cartoon moles, which has been great fun to make, and I have learnt a huge amount along the way, as they have been produced using a new technique to me. In a previous blog post, when I showed the first cartoon designs I created, I was sketching on paper, scanning them, cleaning up the excess marks in Photoshop, and then filling them with colour overlaid with a texture. To me, this was preferable to drawing with vector shapes as the emotion was lost in the process. However, I had not realised the capabilities of the Brush Tool in Illustrator, which I only truly understood after watching this amazing tutorial below. I was immediately sold by this new technique, as I could see the enormous benefits this could bring to me, as the vector strokes could be easily re-sized, no cleaning up was necessary, and the lines were adjustable, allowing me to edit rather than redraw the stroke. I would still start with a sketch scanned in, but would redraw it in vector using Illustrator. Some early attempts using my old trusty Wacom Bamboo graphics tablet provided really pleasing results. I eventually found a suitable set-up using three brushes. To make these, I went to Brush > New Brush, chose Calligraphic Brush and set each brush at 3,2 and 1pt respectively. 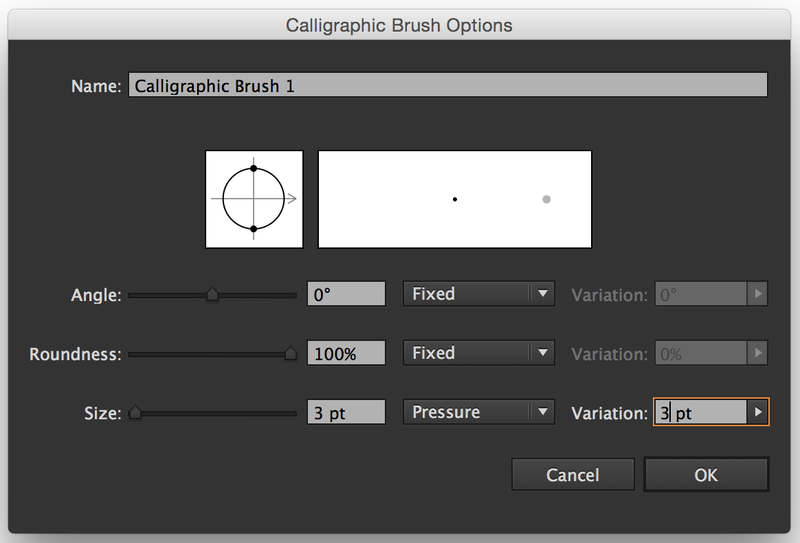 The settings for the 3pt brush can be seen below. 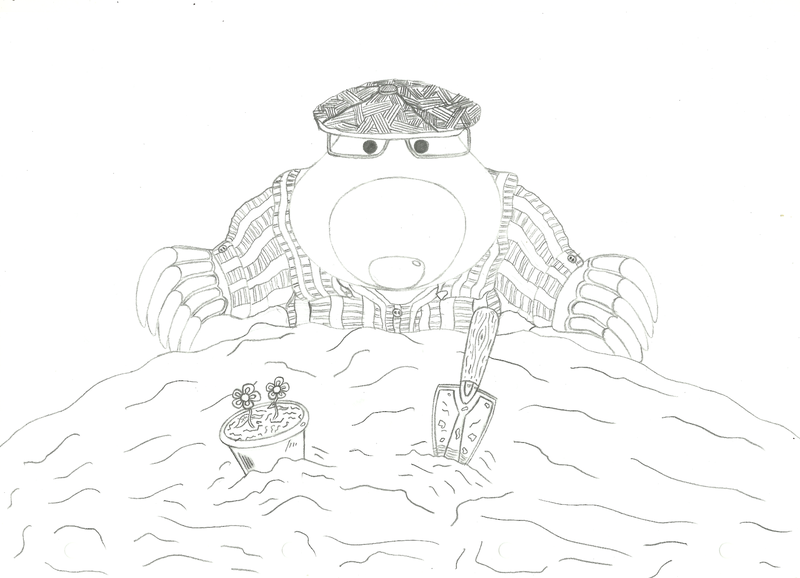 The idea for the set of designs was well established in my mind, although I hadn’t put pencil to paper yet. 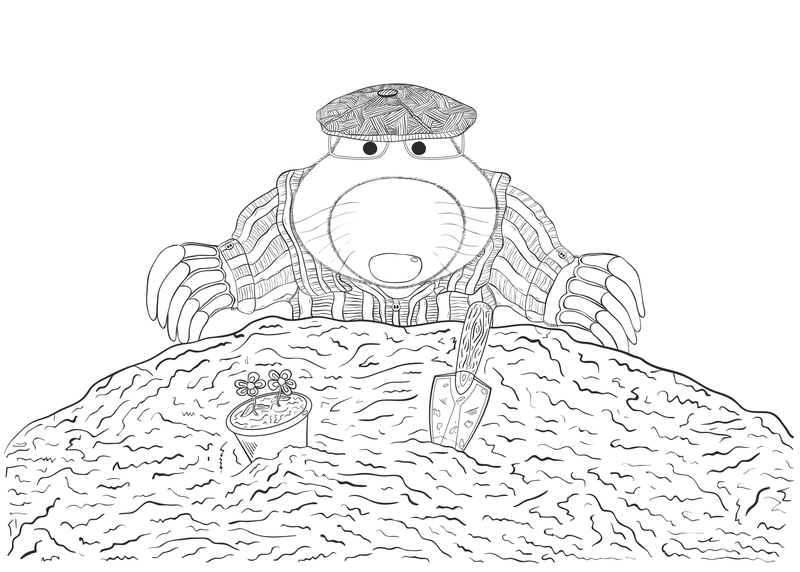 I needed a reference image of a mole to learn from, and I eventually found one on Pinterest. I then drew some guidelines from this, and printed it so I could start sketching my design on top. I was very pleased with the end result, but it did not take long for the sinking feeling to crashing through the door as I realised it was not up to standard. Asking other people for their opinions confirmed my concerns, so on I went to improve the design. 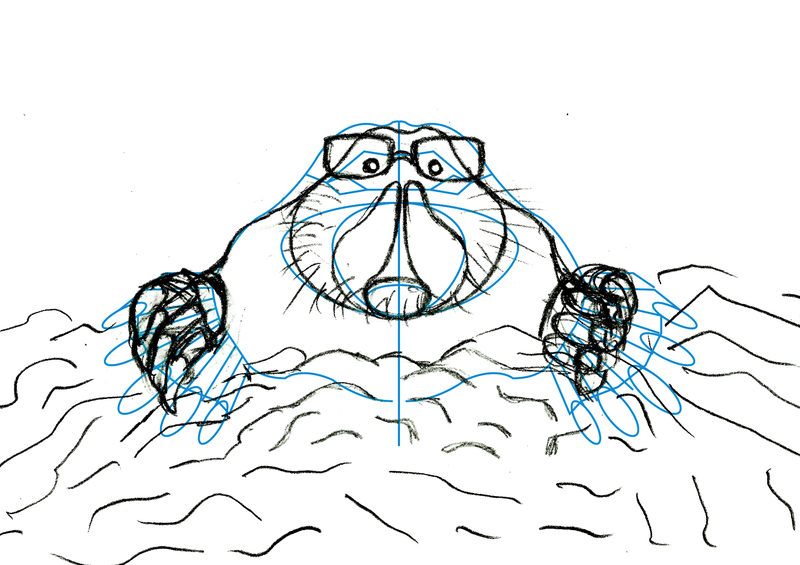 The nose was to be re-drawn and simplified, the claws needed re-shaping and the eyes needed re-positioning to better fit the glasses it was wearing. Another change, which really made the difference, was when trying to illustrate it wearing a jacket as I could not fit it into the image. A couple of line strokes later to turn the space behind the claws into arms’ made the posture much more human, which was to identify very well with the ideas I had. Ah yes, the ideas! 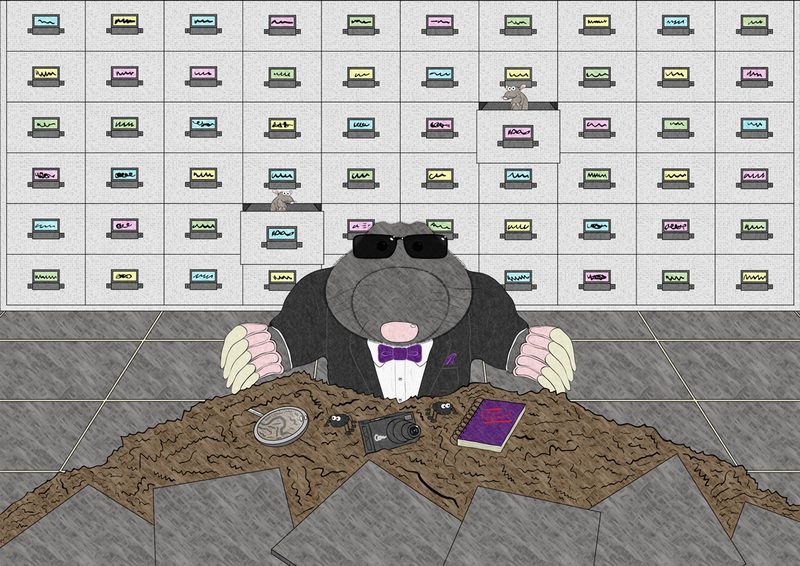 As you may have gathered from the above image, that’s ‘Agent Mole’, created due to the common fact the word ‘mole’ can also mean an undercover spy. 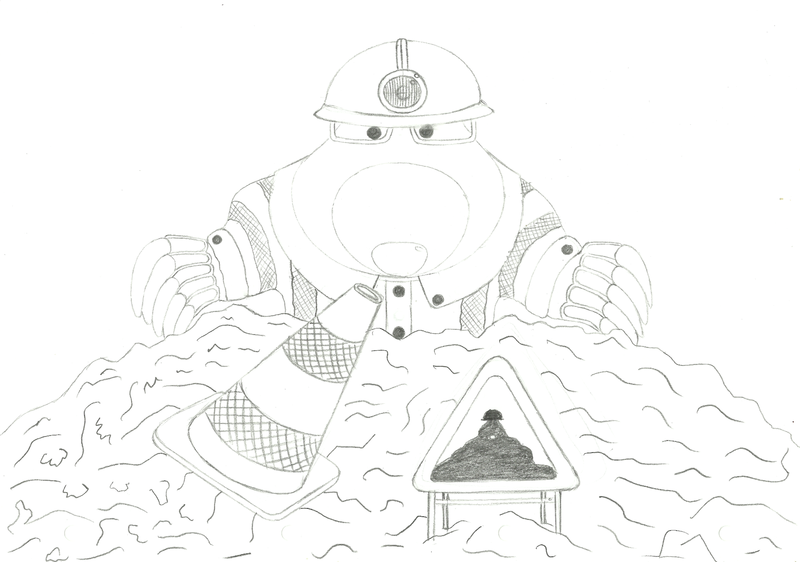 As you would have seen at the beginning of this blog post, the second design was ‘Country Mole’ — playing on the joke that moles are not loved by gardeners — while the third was ‘Roadwork Mole’, because a group of molehills is not dissimilar to a set of roadworks! Combining these ideas with the improvements to the sketches allowed me to reach the stage where I decided to scan in the sketches and move over to the graphics tablet exclusively. Starting with a 3pt calligraphic brush set to Pressure with 3pt of variation, I began sketching the Country Mole design (no idea why I did that one first!) and managed to find a really pleasing rhythm that allowed me to recreate the design quickly, no doubt because of the ability to adjust lines as I went. The only challenge was that being a calligraphic brush meant a change at one point in the line affected the rest of the line, so sometimes it became a balancing act, and I did still have to redraw lines. One trick I did learn along the way was that by clicking on a line, and then clicking on another brush allowed it to take on the properties of that brush, allowing me to thicken and thin lines as required, which was a huge help. After completing version 1, I wanted to test the filling process in Photoshop to see what revisions needed to be made to the design. I still choose to use Photoshop over Illustrator because it has the Pattern Overlay that makes it look like it has been coloured in by hand. 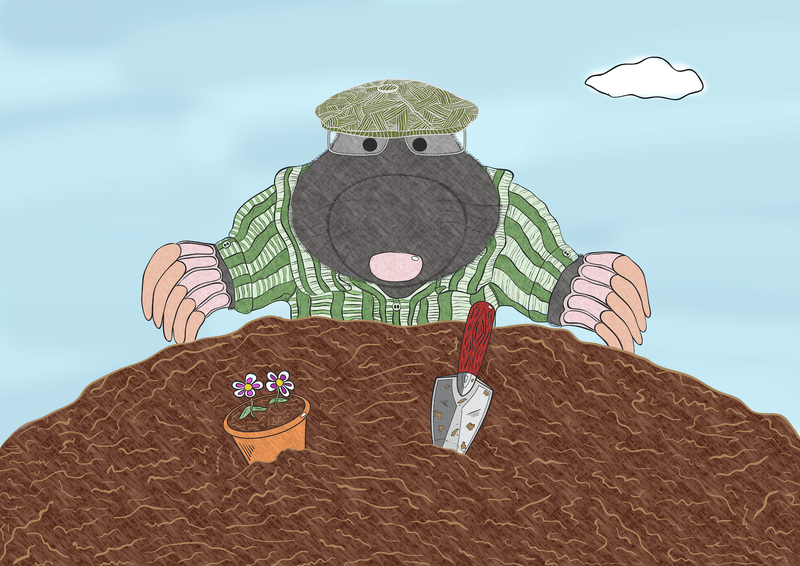 The first attempt, which is below, ended up looking pretty terrible, with a massive list of things to fix, such as the stripes on the shirt and flat cap were too thick and close together, while I realised the image needed a mid-ground to tie together the foreground of the mole and soil with the background of the sky. Despite the long list of faults, I was still optimistic the end result would be worthwhile. Moving back into Illustrator, I soon made the necessary revisions with version 2. 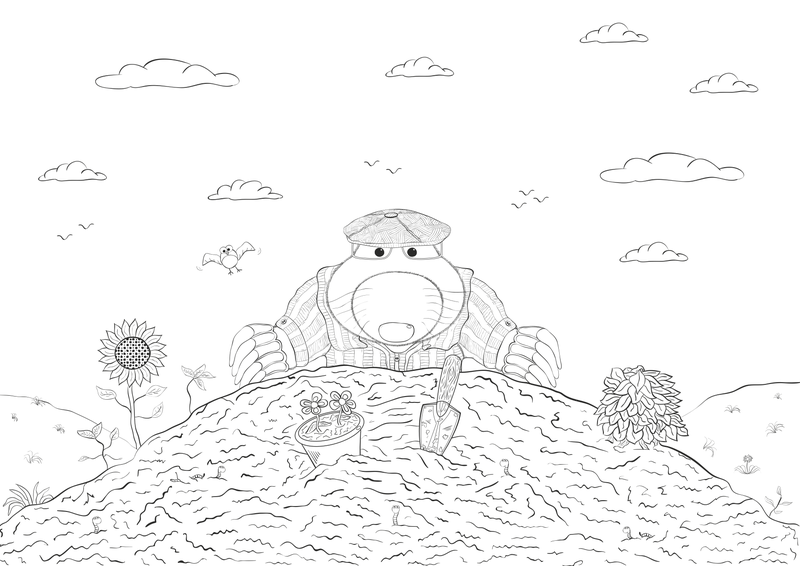 Along the way, the soil had grown so that I could fill some more strangely shaped products on Redbubble and Society6, such as the mugs which require little height, but huge width to the design that is uploaded. On top of this, I had decided the soil needed some more interest added, so I enlarged the plant pot, and dotted a few cartoon worms around! Version 3 dealt with the mid-ground of the image, adding in some foliage as well as a sunflower to add a real splash of colour. I then moved onto the sky, adding in some fluffy white clouds and a robin. Robins, as I have discovered are a gardener’s best friend! If you’re digging the soil or cutting back plants, they’re normally there keeping an eye on you seeing what food you uncover! To use the design in Photoshop, I found I needed to increase the size of the design up to A0 to ensure it was large enough to cover the wide range of products I was looking to sell these designs on. To do this, I grouped the design, copied it into a new A0-sized document, and expanded it, to ensure when enlarged, it would remain in proportion. From there, I could export it as a PNG with a transparent background and set about to work in Photoshop. Once opened in Photoshop, I added a white background on a separate layer, and worked by the rule of adding a new layer every time I wanted a new colour. This made things easy to find and kept colours apart so they never mixed. I generally used the Magic Wand tool, selecting an area and filling with colour. 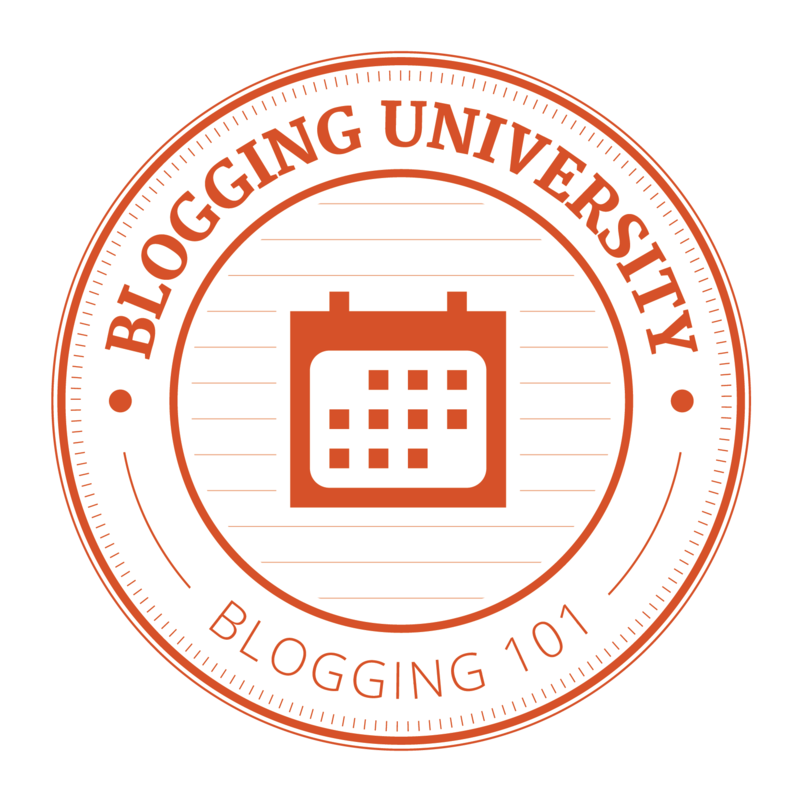 One tip I learnt was to expand the selection by one pixel to remove the small white border that occurred around the edges of selections. 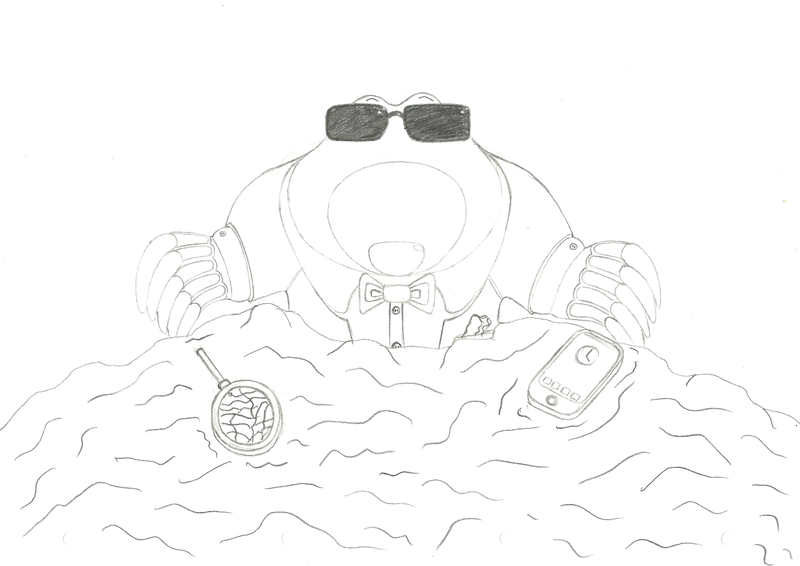 I did also need to add a layer above the drawing to add lenses to the mole’s glasses so that it covered the eyes. Most layers saw a Pattern Overlay applied and blended in, to give the appropriate texture to layers. All this led to the finished result for the first design! For the other two designs, the process was much the same as I’ve detailed for the first design, except it was quicker as I could use all of what I learnt along the way. 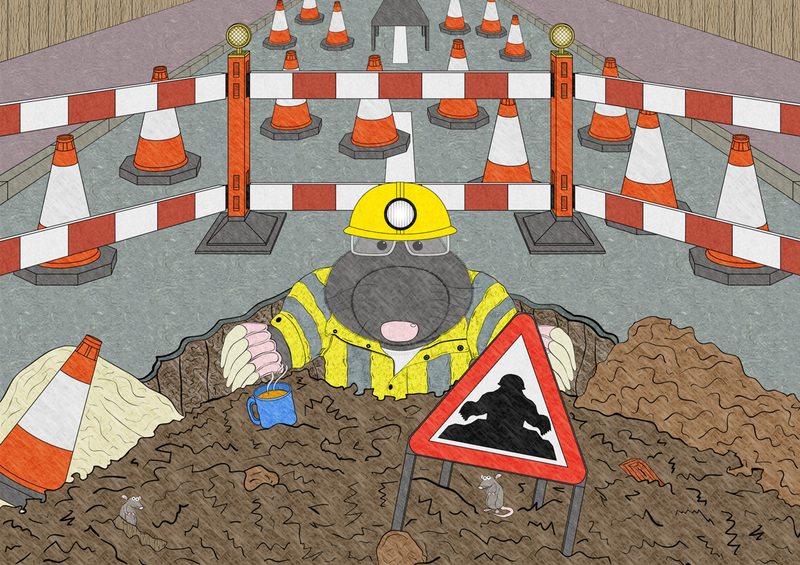 Below I have placed a couple of animation that shows the development stages taken with Roadwork Mole and Agent Mole. So you can buy them! Yep, if you’re interested in having these designs on something, then they are available both in my Redbubble and Society6 shops on a whole range of wonderful items, some of which I’ve shown below in a little animation. That’s all for now! Love these moles! I can see them gracing someone’s home on all sorts of objects ;-). I especially like the little cheeky mouse/rat – a nice touch. Well done! ← Photoshop Tutorial: Create a metallic silver or gold vehicle in 3 steps!